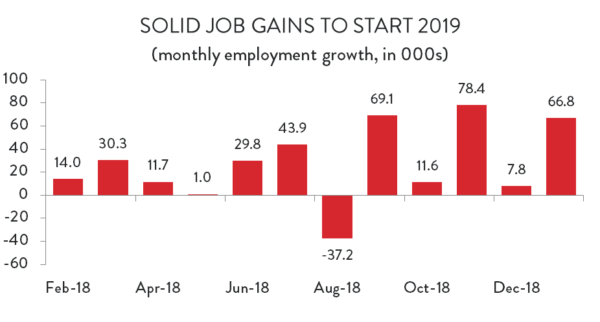 The Canadian job market started 2019 off on a solid note, driven by a surge in services-sector employment in Ontario. All told, Canada added 66,800 net new jobs in January (an increase of about 0.4 per cent) and continued a hot-cold pattern that sees solid job gains one month, followed by flat or declining employment in the next. July, September and November also saw strong job creation, but in each case, there were either job losses or negligible gains in the following month. Strong job gains in January also mean that year-over-year employment growth is starting the year off well. There were about 327,000 more Canadians working at the beginning of 2019 than at the start of 2018 – an increase of about 1.8 per cent. By comparison, job growth for all of 2018 averaged out at about 1.3 per cent. Robust job gains also encouraged more Canadians to try their luck in the job market. The labour force participation rate rose from 65.4 per cent in December to 65.6 per cent in January – its highest level in more than a year. This resulted in a rare situation where, despite strong employment growth, more people entering the labour force drove the jobless rate higher. The unemployment rate rose from a record-low 5.6 per cent in December to 5.8 per cent last month. 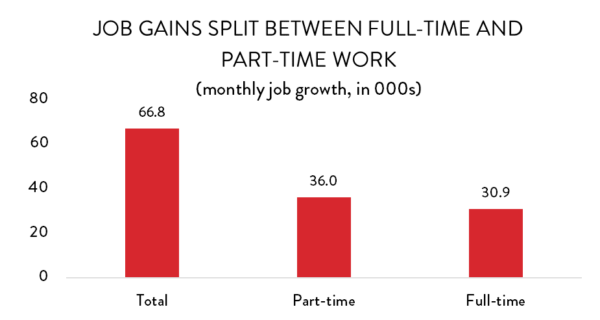 January’s job gains were more or less evenly split between full-time and part-time positions. Of the 66,800 net new jobs created last month, about 36,000 were part-time, while the remaining 30,900 were in full-time positions (numbers do not add up because of rounding). However, considering that only about 19 per cent of jobs in Canada are part-time, this even split in job growth suggests a disproportionate skew towards part-time work, which has a less positive overall impact on the Canadian economy. January also saw relatively healthy wage gains across Canada as tight labour markets may finally be exerting upward pressure on the cost of employing workers. Average hourly wages were up about 0.6 in January, building on a 0.5 per cent increase in December. Those figures represent the fastest month-over-month wage increases in about a calendar year. 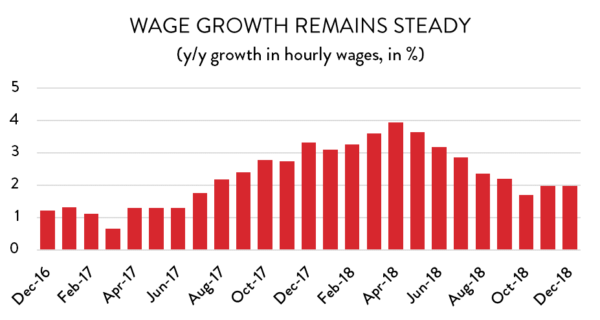 However, because of weak growth over the summer and fall, average wages in January are still only about 1.9 per cent higher than they were at the beginning of 2018. That’s about on par with the rate of inflation, meaning that consumers’ purchasing power is not improving. That said, pressure appears to be building on the wage front, and we could see average wage growth accelerate in the coming months. Provincially, the lion’s share of new jobs across Canada were in Ontario, but there were actually solid gains in most provinces. Ontario created about 41,400 net new jobs in January – about 62 per cent of all new jobs nation-wide, and an increase of about 0.6 per cent. 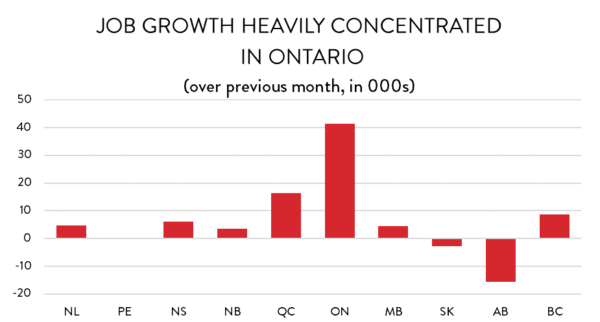 On a percentage-growth basis, however, there were even stronger gains across Atlantic Canada (except for PEI), with month-over-month growth ranging from 1.0 per cent in New Brunswick to 2.1 per cent in Newfoundland and Labrador. On the other side of the spectrum, Alberta and Saskatchewan stumbled out of the gate in 2019. The Alberta economy lost 15,500 jobs in January (a decline of about 0.7 per cent), adding to the 15,000 lost in December. Employment levels in Saskatchewan were also down for the second month in a row, although the decline there was less severe. 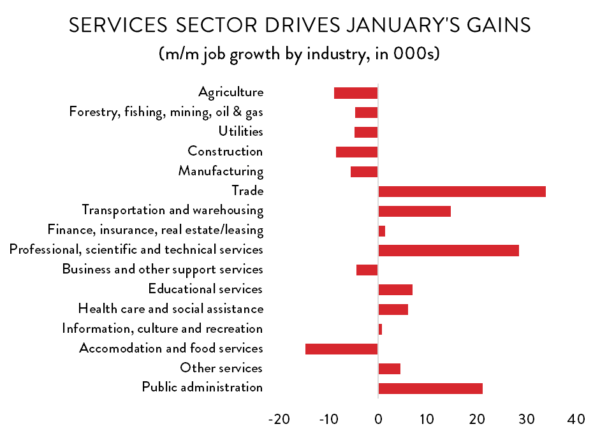 At the industry level, the story was one of strong gains in services-sector employment and weakness on the goods side. There were more than 99,000 new net services jobs created across Canada in January, while employment in goods-producing industries fell by about 32,300 positions. Leading the way on the positive side, there were nearly 34,000 new jobs created in wholesale and retail trade – more than enough to recover December’s losses. There were also notable gains in professional services industries (28,500 jobs), as well as the public service (21,100). The increase in public service jobs represents a recovery from a sharp decline in December. Since public sector employment is relatively stable, this odd movement is likely tied in some way to the Canada Post strike late last year. It was cross-the-board red ink on the goods side. The sharpest declines were in agriculture (8,900 jobs lost) and in construction (8,500). Consistent with the trend in other goods-producing industries, manufacturing employment was down to start 2019. There were 5,500 fewer manufacturing jobs across Canada than there were in December – a decline of about 0.3 per cent. 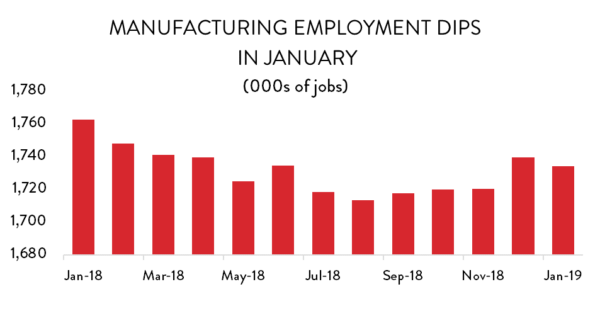 The silver lining here is that, unlike elsewhere in the goods sector, the decline in manufacturing employment in January represents only a partial loss of the strong gains made in December; there were about 19,200 net new manufacturing jobs created in the last month of 2018. In spite of January’s job losses, the unemployment rate in manufacturing fell dramatically compared to December – from 3.9 per cent to 3.4 per cent. That odd movement is the exact opposite of what happened in December, when the number of manufacturing jobs rose sharply, but so too did the unemployment rate. These unusual trends may simply represent a survey glitch; they could settle down in the coming months. Tight labour markets are starting to exert pressure on wages in the manufacturing sector. 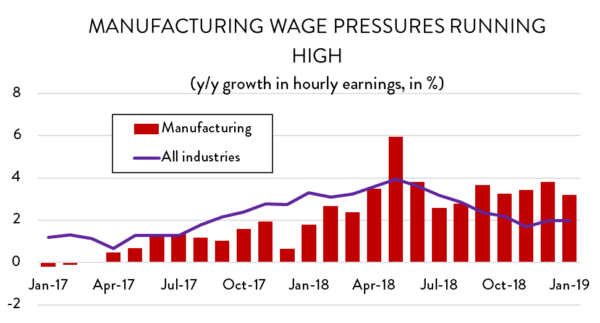 On a month-over-month basis, manufacturing wages rose in line with the all-industry average (0.6 per cent in manufacturing, compared to 0.5 per cent in total). However, manufacturing wages in January were about 3.2 per cent higher than they were 12 months ago – about twice the year-over-year growth rate for the economy as a whole. The increase is most pronounced in Saskatchewan and PEI, where manufacturing wages are about 7.5 per cent higher than they were a year ago. 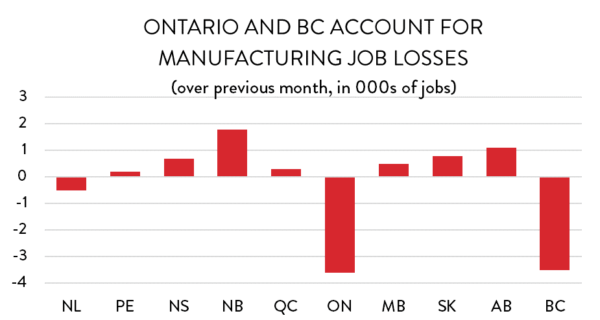 At the provincial level, manufacturing job losses were concentrated in Ontario and BC. Ontario lost about 3,600 manufacturing jobs to start the year – a decline of about 0.5 per cent. In BC, the loss of 3,500 jobs represented a drop of 2.0 per cent. There were also 500 fewer manufacturing positions in Newfoundland and Labrador, as that province gave back some of its gains from the fourth quarter of 2018. Except for those three provinces, manufacturing employment was actually higher across Canada. There were strong gains across the Maritime provinces as each of the three bounced back from losses at the end of 2018. January was also a good month for manufacturing workers on the prairies, as Manitoba, Saskatchewan and Alberta all posted healthy gains. Manufacturing employment in Alberta is now at its highest level since the summer of 2015.